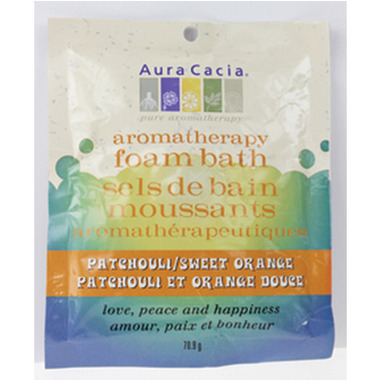 Create an at-home spa treatment with Aura Cacia's Foam Bath! It activates the senses, energizes the body and awakens the spirit. Crafted with balancing jojoba and gentle coconut cleansers to leave the skin soft and silky smooth. Suggested use: Dissolve contents into running bath water and step into your luxurious foam bath! Due to the foaming nature of this product, use sparingly in whirlpool tubs. Ingredients: Sodium Bicarbonate (Baking Soda), Sodium Chloride (Salt), Citric Acid, Sodium Cocoyl Isethionate, Cocamidopropyl Betaine, Citrus Sinensis (Sweet Orange) Oil, Citrus X Limon (Lemon) Oil, Pogostemon Cablin (Patchouli) Oil, Simmondsia Chinensis (Jojoba) Oil. This is one of my favourites. I use this packet in two portions so the smell is just right and I stretch my dollar :) I'm a patchouli girl so I love the smell. Feels good on. I can't handle all scented bubble baths but this one agrees with me.